On our 2nd Facebook Live Show, we have a discussion on why we need to help the IEP team and society as a whole, not look at our children through a Deficit-based lens. The way an IEP is designed and implemented to be meaningful, as well as effective is based on which lens the team members use to a view a student. The term “deficit” is defined as the amount by which something is too small. In sports, it is the amount or score by which a team or individual is losing. It can also be defined as a deficiency or failing, especially in a neurological or psychological function. So, if we think about IEP’s and people with disabilities as having deficits, we think about them as not being enough, as losing or failing, in some way. We do not think of our boys as not being enough or of being losers or as failures. So, we want to make sure that our children’s IEP team doesn’t think of them that way as well. Yet, when we focus heavily on what our children are NOT able to do, that’s the message that is sent, whether we realize it or not. When we focus heavily on what our children CANNOT do, we develop what is called a “Deficit-Based Lens”! When we use that lens, we see people this way, we see them as a deficit. Schools and teachers have focused so long on our children’s deficits, that it is hard for them to view our children any differently. When you think of a pyramid. You think of the base being wide and the top being narrow. When we look at students through a deficit-based lens, we spend the most amount of time focusing on the top of the pyramid their disability and what they can’t do. The school does not become aware of the strengths which is the bottom part of the pyramid, the strengths your child brings to the table, and we are not operating in regard to the Least Dangerous Assumption. The road we are taking is, in fact, the Most Dangerous Assumption. It is the road that leads toward segregation and isolation! What if we invert that pyramid, standing it on its head? So if you turn the pyramid around you start with what the child CAN already do, focus on their strengths, because small successes lead to a building block for growth and empowerment. When educators are working from a strength-based lens, programs emerge that are “centered on the child”, respectful and empowering to the student. The school needs to spend most of their time and effort here to identify your child’s strengths and weaknesses and to find what meaningful resources and supports are available to create strength-based SMART IEP goals that will enable them to develop skills, gather knowledge and have access to the grade level curriculum and learn in their own unique way. 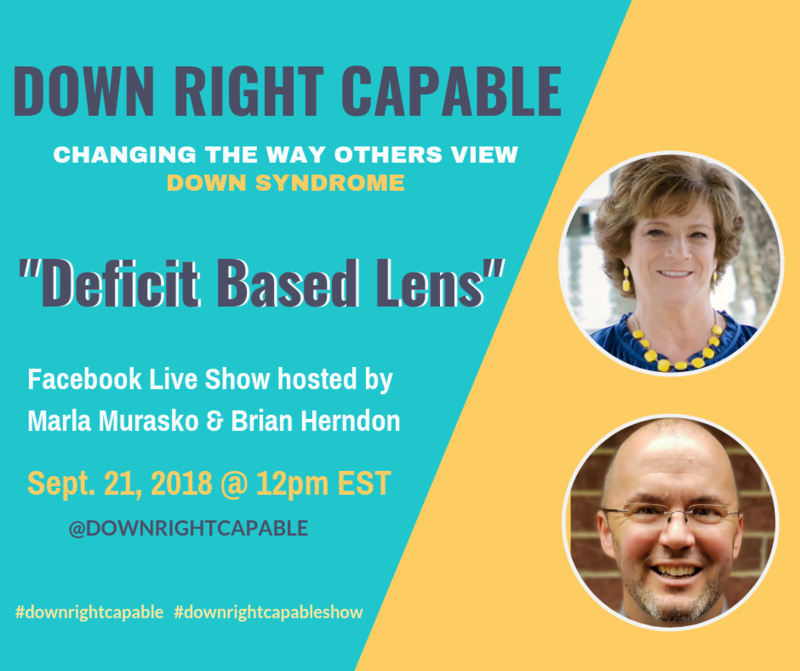 Head over to our Facebook page, Down Right Capable, to view the shared resources, and stay tuned for our next show in October.